Learn the 17 composition methods you can use to ensure your artworks are pleasing to the eye. Have you ever had a painting that just didn’t look right? Getting the composition of your painting correct can mean the difference between a painting that turns heads and sells in an instant to one that just looks wrong. Trying to fathom out how to compose a painting can be a daunting affair for many artists, especially when working from photographs. Many artists will be surprised to know just how many different types of compositions there are to choose from, most only know of only 3 to 4 at the most. In this course, Dennis reveals ALL 17!!! Dennis has put all his 65+ years worth of composition knowledge together in this course to enable all artists to producing better quality paintings. Paintings that tell a story, paintings that people remember, paintings that sell. Dennis also unravels the secret to the mystifying Golden Mean – you will be amazed at the surprising conclusion which reveals the best place to paint your focal point. 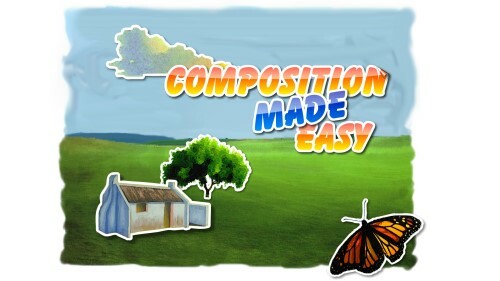 Throughout Dennis uses many photographs, illustrations and animations to show you exactly how to use each composition type. This course is a MUST for the every artist – from the rank beginner to the professional. The course also includes a handy printable composition reference chart as well as a bonus set of videos where Dennis analyzes some of his paintings as well as takes you through the full process of composing a painting – from idea to composition to final painting.